Overview Signs and symptoms of cerebellar disease presents on the same side (ipsilateral). 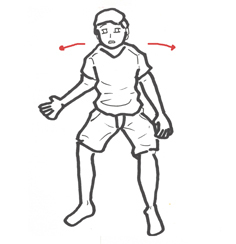 Symptoms and signs consist of gait impairment, unclear (“scanning”) speech, visual blurring due to nystagmus, hand in- coordination, and tremor with movement. Frederichs ataxia is a autosomal recessive ataxia, comprising one-half of all hereditary ataxias. Two forms classic (frataxin) and association with vitamin E deficiency.